First mentioned in 1571 in connection with the Izium Warpath of the Crimean Tatars. In 1639 was mentioned as small outpost. In 1681 Russian fortress was built here, in 1684 - the five-domed Baroque cathedral of the Saviour's Transfiguration (The cathedral was renovated in 1902 and restored in 1955). 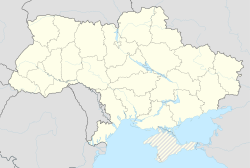 Later, Izyum was a significant centre of the Sloboda Ukraine and home to a regiment of Cossacks between 1688 and 1765. In 1765 Izyum became a city. In 1780 Izyum became an uyezd city. The churches of Ascension (1819–21) and of St. Nicholas (1809–23) rank among the finest Neoclassical buildings in the region. During World War II, the Red Army held a large bridgehead here, allowing for a salient that was cut off by counterattacking German forces (during the Second Battle of Kharkov) and eliminated in one of the most expensive learning errors for the Red Army. Izium was occupied by the German Army from 24 June 1942 to 5 February 1943. The town was the site of sporadic fighting during the 2014–15 Russian military intervention in Ukraine. In April 2014 Russian separatist forces occupied the city of Sloviansk 30 miles south of Izium. An operation by Ukrainian forces to remove these forces bogged down and checkpoints around the Izium were formed to stop possible intrusion into the city. On June 15 a Ukrainian checkpoint outside the city was attacked by Russian forces. On 19 June 2014 Ukrainian forces defeated a large group of Russian separatists at Yampil, approximately 40 miles southwest of Izium, signaling the furthest north the Russian forces would advance. As part of the Siege of Sloviansk and Battle of Kramatorsk both cities were recaptured by Ukrainian forces. Due to its proximity to the front line the city, along with the Kramatorsk Airfield which the Ukrainian military was able to control through the battles, served as a staging area for Ukrainian troops prior to Sloviansk and Kramatorsk being recaptured. European route E40 passes through Izium, connecting Luhansk-Sloviansk-Kharkiv, three important cities to both pro Russia and Ukrainian forces. Controlling the highway was instrumental as it was the fastest access route into Sloviansk, as well as allowing for possible expansion of separatist territory into Kharkiv region. The Sloviansk-Izium highway was referred to as the "highway of death" by locals during the summer of 2014, however large scale fighting halted once Ukrainian forces captured Sloviansk. Early April 2016 the Security Service of Ukraine arrested an alleged saboteur who was accused of wanting to explode the railway near Izium to aid the separatists. In order to comply with decommunization laws the local ‘Soviet Square' was renamed ‘John Lennon Square' in February 2016. ^ "Ukraine – Shooting At Checkpoint Near Izium". United Patriot. ^ "Ukraine rebels speak of heavy losses in battle against government troops". Reuters. ^ "Fears remain as rebels flee Sloviansk". BBC. ^ "Military seize airfield controlled by anti-govt activists in eastern Ukraine". RT. ^ "Дорога смерти Изюм – Славянск: как это было". Information Resistance. ^ "Izmium, Ukraine Climate data (Period supervision: 1949–2011)". Climatebase. Retrieved April 6, 2015.